Hopefully you'll get that snow, Phil. We're in a sunny warm pattern right now. Not unusual for Texas this time of year. 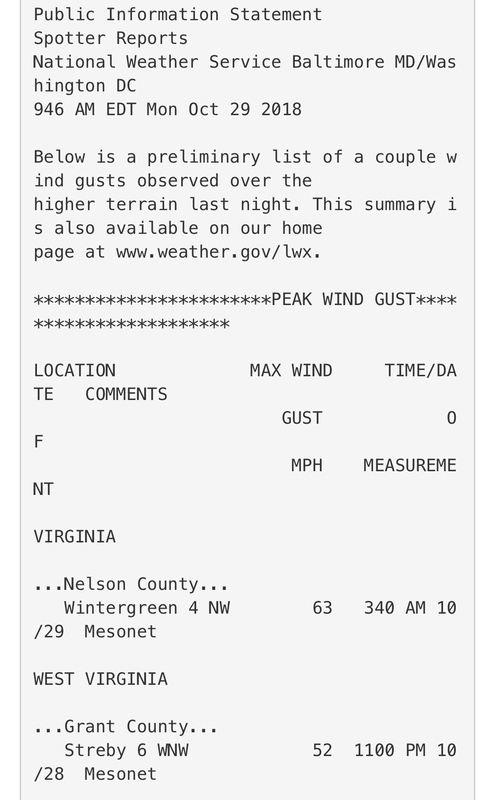 Wintergreen gusted to 63mph last night. Well we don’t get the beauty of the Northeast in fall but we managed some nice yellows and oranges on the 7th and8th fairways. 82* and sunny with a wonderful breeze. I’ll take it. Humidity’s low and life is good! 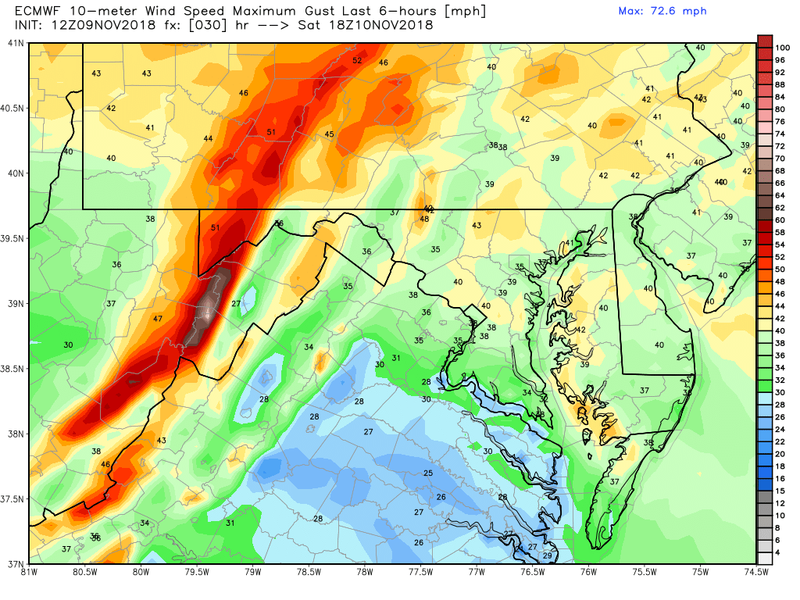 Wintergreen hit 58mph yesterday evening. Watching for a severe squall line this afternoon with the frontal passage. Looks to be timed well w/ the jetmax and decent upper level support. Could be fun. 71mph gust just east of Westminster! nws is going to be investigating those locations to see if these were micoburst or possably a tornado or two that spun up with in the line which can not be ruled out.eather way legiment outbreak from florda all the way up the coast with this system.no severe here but did get heavy rains and two good thunder claps and lighting flashes so legiment thunderstorms and not just the ordanary line with no lighting and thunder. Wow..looks like hurricane force gusts in numerous locations. Partial building collapse in Baltimore, roofs ripped off homes in Duncalk, MD. Wow..some really impressive stuff. These QLCS events always perform somewhere. Had a heavy wind gust and 1” of rain in 15 minutes here, but no damage locally. Narrow miss. We have a front moving in tonight. Our winter weather won't hit us until a cold snap in early Dec. most likely. Jan-Mar. is when the snow and ice will hit this winter. And I AM expecting a wet, snowy winter. Update:..... A line of brief but heavy thunderstorms just passing over us. Temps will drop tomorrow with this. Typical spring or Fall pattern for us. Pretty wild Fall. Winter will be interesting. Slight risk of severe thunderstorms here on Election Day, according to SPC. Gonna be a raging low level jet and gusty all day, even more-so than last week. Highs should reach 70+ degrees on Tuesday. High 77*. Low 59*. Sunny! Front moving in Tuesday night rain most of Wednesday. Typical Texas fall. Sun, front, rain, Rinse and repeat! This one busted..front trended faster/earlier in the day which didn’t leave enough time for the cold wedge to erode..so the squall line ended up being weaker and farther south than initially expected. Plenty of rain over the last 2 days, though. Some minor to moderate flooding is ongoing. And looking ahead, a legit shot of polar air looks to arrive this weekend. Should dry things out somewhat. Dave Tolleris apparently is going 200% average for snow this winter Tony Pann from Wbal channel 11 is going with 3 big storms.Justin bruke has not gave out his forecast yet but says he will be sometime this week those from the sound of it he seems to be thinking snowy and cold he did nail last winter by saying the storms would be near misses for us which is exactly what happen lol so he does have a legit record only time will tell. Pea soup fog here this morning. Can barely see the streetlights. In No. Tx. We're at 60* and will hold steady there today. Very calm and very much a Texas November day. Repeat today except some light rain after 3pm. Wall of rain moved in here this morning on steady east winds. Most of the leaves are off the trees now. Only the oaks and willows have yet to drop. Cold front should cross the mountains overnight, with gusty downslope winds scouring out the marine layer. Gusts to 70-75mph tonight across the ridgetop communities. Wow, that's just flippin' crazy! We had our first Freeze last night. Locally 29*. No freezing rain or snow mentioned so rain will likely end before temps drop. Around 40mph here today. Just enough to send our tables and chairs flying across the deck (0.14). As a weatherman, and forecasting high winds, what's wrong with this picture? Hard freeze here this morning. 25.2*F with clear skies. Any remaining insects are (hopefully) dead now. No. Texas will see a low of 28* tomorrow night and 26 Tuesday night. As I recall, this is somewhat early for us. 1/2" of rain expected starting at ~10 tonight and ending at noon tomorrow. Might have our first snow/ice storm this week. Currently pouring rain and 43*F.
Polar front just moved through. Dewpoint is dropping like a rock with stiff NW winds. Regarding the winter storm threat, LWX is playing it conservatively, which is not surprising given how unfavorable climo is at this time of year. I’d hedge that way too, pending observations suggesting something contrary. We’ll know a lot more by tomorrow evening, with the temperature/dewpoint spreads telling the tale of the evening. Winter weather advisory issued for up to 1” of snow/sleet and ~ 0.1” of freezing rain accretion. Early in the season, so we’ll see what happens. Could be a more significant storm for the mountains. Winter storm warnings issued out there for several inches of snow followed by up to 0.5” of freezing rain. Currently 37.9/29 with a thickening cirrostratus deck overhead. Holy cow..easily the heaviest November snow band I’ve ever experienced. Got 1” of fluff in 10 minutes. Over to sleet/ZR now. Between 2-3” of snow/ice on the ground. Once we switched over to ice, the wind started roaring almost immediately. The cold stable layer is eroding. Unusual for us to see strong NE winds like this. The trees are accustomed to W/NW winds, and given the saturated soil this is definitely more problematic. Already some intermittent transformer flashes. All the snow has sublimated/melted, though. What a couple of days there Phil! We've been slowly sinking into colder air. Partly cloudy and cold, but the damp in encroaching as well. By the time I made it home this evening at 8pm I was shivering, and temps at 37* after a high of 60*. Most everyone I know is having difficulty adjusting to this early cold. I just want a blankie! Our first true Arctic front of the year looks to arrive on Thanksgiving morning. Of course it’s very early, so *legitimate* cold isn’t on the table, but it looks pretty chilly nonetheless. Thanksgiving looks very sunny with highs in the 20s and lows in the teens with subzero dewpoints. So in other words, a fairly typical airmass by January standards, but legitimately chilly by November standards. Well, true to form, Texas will have a mild Thanksgiving. It's the rule rather than the exception for us. Mid 1990's saw an ice storm, but that's rare. Sun. Windy front blows in but nothing to get excited about. High 57. Low 37. Down in Florida for Thanksgiving, so I was able to dodge the icy weather. Forecast low is 17*F back home tonight with dewpoints in the single digits. Wow, huge bust on temps back home. Clouds kept overnight highs elevated, low was 25.9*F at our place. Winter weather advisory issued for tomorrow. Too bad I’m in FL. Gorgeous day. 75*. Sunny, breeze. Front finally moving in. High tomorrow int he low 50's. Temps slowly rising to 70 Thursday. Then some wind and rain Fri. But we had an outstanding Thanksgiving here. Breaks over, back on our heads ! Back home in MD. Cloudy and 41*F with isentropic lift/rain approaching. Sharp cold front passage after sundown tomorrow. It just keeps raining. Another 0.27” this morning. It’s already the wettest year on record @ BWI, going back to at least 1872. Closing in on the record at both Dulles and DCA too. Just a little over 1” left. Temps now approaching 50*F with misty/foggy conditions ahead of the warm front. Sharp cold front crosses this evening, then a reinforcing shot of cold air arrives Wednesday morning on strong NW winds. Waves of heavy wind rolling down the mountains this morning, with calm in between. Currently 39*F and cloudy.